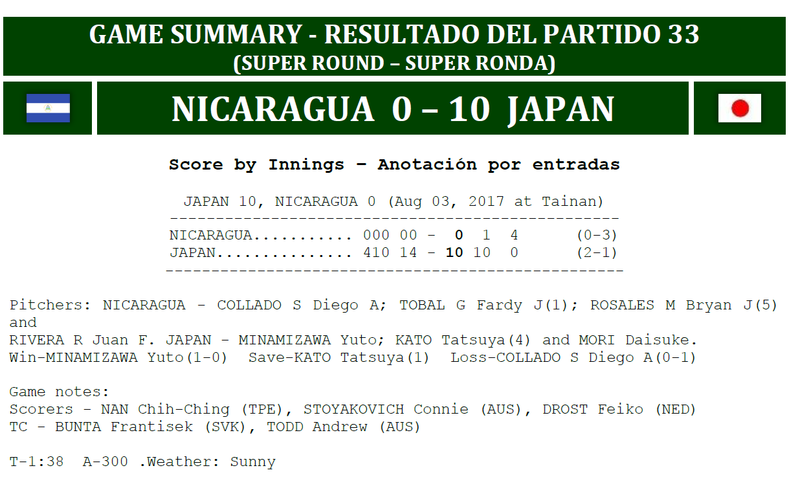 Japan maintains the trend set with the impressive comeback win against Chinese Taipei and proves simply too much for Nicaragua, outscored 10-0. The little Samurai pitching allows only one hit, line up goes double digit with hits and their running game forces 4 errors. 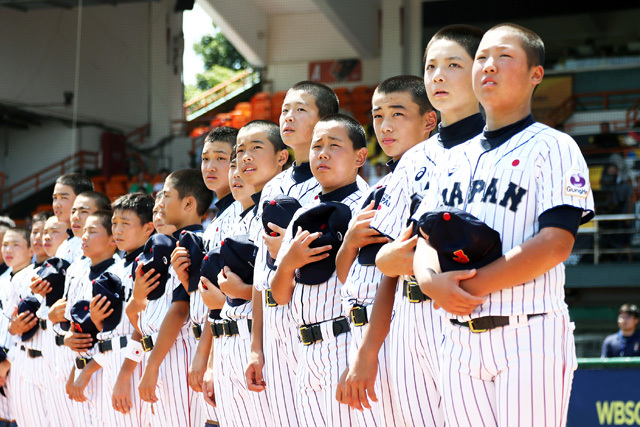 Japan wastes no time against Nicaragua starter Collado. Center fielder Okada is on with a base hit on the very first pitch of the at bat and advances on a balk. Rightfielder Toi singles along the right foul line to score Okada from second. With Toi on second (balk) and 2 outs, pitcher Minamizawa grounds to the left and beats third baseman Torrentes throw to first. First baseman Bravo hesitates with the ball in his hands and Toi rounds third base to score easily. Minamizawa advances on the third balk by Collado and then steals third. Left fielder Oyama walks and steals second. Shortstop Tokunaga sends a roller to the middle. Nicaragua shortstop Machado bubbles it, a rare mistake for the usually smooth middle infielder, Tokunaga is safe at first and both Minamizawa and Oyaga score to make it 4-0. Munguya moves from second to get the third out. Fardy Tobal heads to the mound at the bottom of the second and shows a tendency to balk under pressure similar to that of starter Collado. With runners at second and third, Minamizawa sends a hard grounder to shortstop. Machado stops the ball diving, but cannot come up with a play and Toi scores from third. Yamaguchi goestoo far circling third and Machado gets him with a throw to new thirdbaseman Collado for the third out of the at bat. Minamizawa completes 3 innings of no hit ball and leaves the mound to lefty Tatsuya Kato. Nicaragua rightfielder Tito Martinez turns his third pitch into a double in the right center gap, then advances to third on a balk. Kato prevents Nicaragua from scoring striking out 3 in a row to end the frame. Yamada (single) and Okada (double) manufacture a sixth run for Japan in the bottom of the fourth and some good defense (by left fielder Mirand on a liner by Mori and by first baseman Bravo on a throw in the dirt by Machado) prevents more. Japan takes full advantage of a couple of errors, 2 wild pitches and a bases loaded walk to cut it short with a 4 run fifth at bat.